Today, we'll see how the main replication mode will work. A next post will explain about tiering (not planned for now, but very likely this year). To workaround this situation, you can use both techniques, but it's a kind of a manual thing to manage. That's why we started to think here at Xen Orchestra. Why not providing more than an UI to administrate, a backup solution and a cloud tool? Why not having an awesome stack and keep things easy to use? 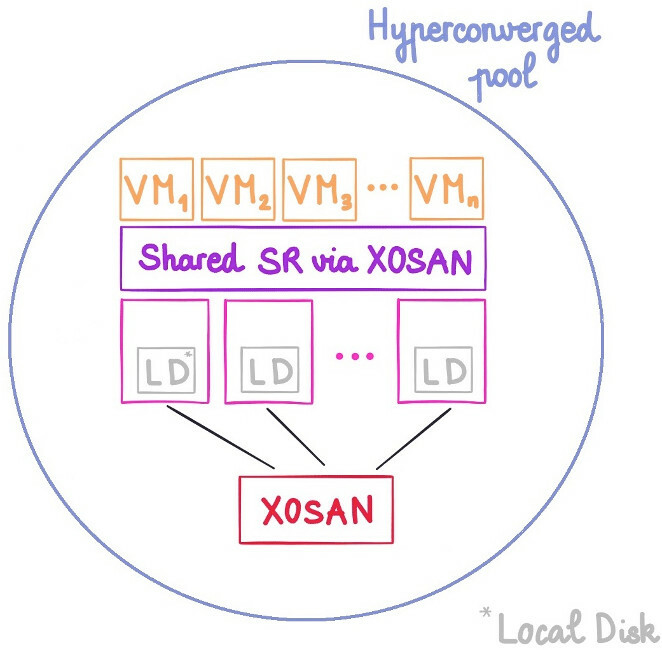 So we started to work on "XOSAN", to unify compute and storage! Indeed, replicating on more than 1 hosts will give a lot of overhead. Eg, if you have 12 hosts with a 500GB SSD each, you don't want to replicate data on every node. Well, this is very safe but you can only use 500GB of disk space. So what can we do? We need something better! Let's take our previous scenario: 12x hosts in the same pool, with a free 500GB SSD drive in each. Total space combined is 6TB. It means, if you use local storage on each host, you can use 6TB of space for your VMs (if you can fill each 500GB drive). But if you lose 1 host, all the data on it are just… gone forever! And what about replication? 500GB on 6TB means 5.5TB wasted (ouch, but you can lose all but one host, which is an ultra resilient pool!). Not good. This is where erasure code mode come to the rescue: this mode allows you to choose how many host you can lose without actually losing your data. "Erasure n" will allow n hosts lost without anything going bad. As you can see, this mode is really useful: it combines a really small space overhead AND security/resiliency on your data. Which mode to choose in this example? Well, it's up to you! 2 failures tolerance is already good, and you'll have 5TB in your storage, which is pretty nice! Is it scalable? Yes, absolutely. Even better: 12 nodes will be faster than 3, because each piece of data will be accessed on different hosts (depending on the replication level and your network speed). Obviously, we'll run benchmark in multiples situations to validate that claim. Remember the first replication benchmark on 2 hosts? Now I got a third node, and I can use erasure mode with 1 failure possible. The only thing that's slower is sequential write speed. This makes sense, because of the extra computing power needed to send data on all 3 nodes at the same time. And it's not bad at all, because 3 nodes is the "worst" setup possible: remember, more nodes, better performances! Also the 1 gig network could be a bottleneck, we'll investigate on a 10 gig net to check if it changes something.